Option 1: Bus pass only. A flexible, hop-on-hop-off bus pass which includes travel and some inclusive activities, but no accommodation or meals. Option 2: Flexi tour. Hop-on-hop-off bus pass + 1 night’s accommodation in each stop off and exciting extra activities. You can complete the travel route in a minimum time of 13 days, or enjoy the freedom to hop on and hop off and add in independent travel time: Most of our travellers spend 2-3 weeks exploring Thailand and Laos. 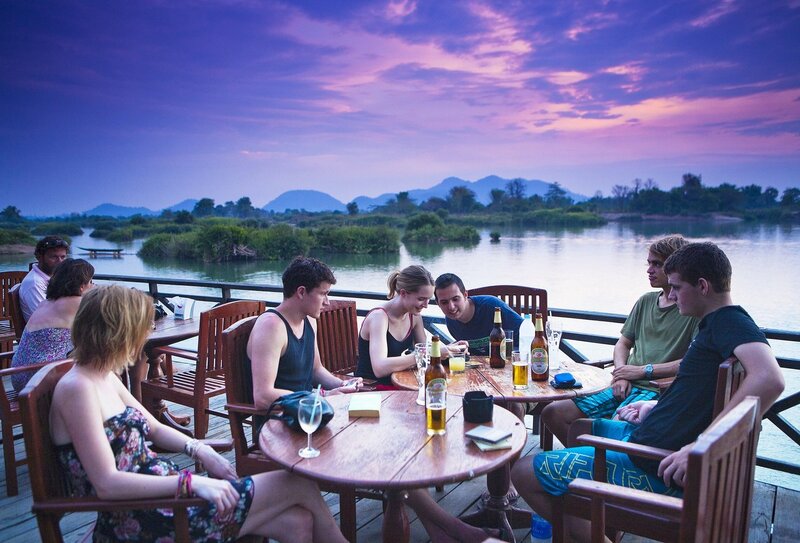 See stunning sights such as Bangkok, Chiang Mai, the Mekong River, Luang Prabang, Vang Vieng and Vientiane. Take your time travelling at your own pace! Head off the beaten track, visit unique locations and enjoy exciting activities on this unforgettable Asian bus pass adventure! Option 2: Flexi tour. Hop-on-hop-off bus pass + 1 night’s accommodation in each stop off and extra activities. Travellers on both options 1 & 2 can complete this bus route in a minimum tour time of 13 days or you can hop off to stay a little longer in any of the destinations along the route. 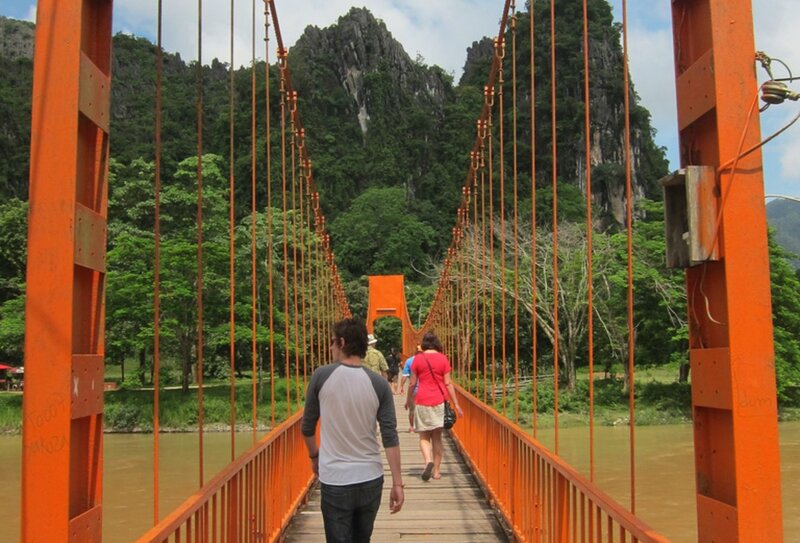 Most travellers choose to spend 2-3 weeks discovering Thailand and Laos. Please note: The following itinerary is a guide based on the minimum number of days to complete the bus route. This is a flexible bus pass so you can spend as long or as little as you like in each location. Just jump aboard the bus when you’re ready to go! We recommend you spend at least a couple of days in each location to get a real flavour of Thailand and Laos. You should arrange your arrival into Bangkok today ready for an early start to your brilliant bus pass adventure in the morning! 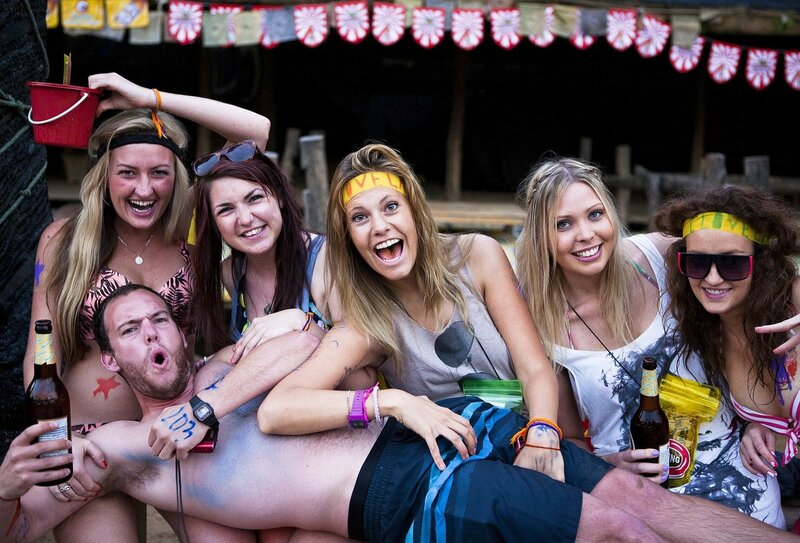 Meet up with your fellow travellers on Thailand’s legendary Khao San Road for a welcome evening meeting and get the low down on how your pass works and what adventures lie ahead. Then get some kip for the next day (after a few cold Khao San beverages of course...). This epic Asian adventure begins in the lively Thai capital city of Bangkok, with an early 8am start. Meet your tour guide and group for an introductory chat before you hop on the bus and make tracks for your first Asian destination, the ancient city and UNESCO World Heritage site of Ayutthaya. Explore this amazing, historic site on a bike tour or relax on a boat journey through what is known as the “Venice of the East”. An overnight train or bus journey leaves late evening for your next stop, the Thai city of Chiang Mai. Free inclusions for all travellers: Overnight train or bus, temple entry in Ayutthaya. Extra activities included (option 2 only): A half-day boat or bicycle tour of the impressive Ayutthaya UNESCO Temples. Arrive into Chiang Mai between 8-11am. Discover the wonders of this vibrant Thai city today and visit Chiang Mai’s ancient city sights, such as one of its 300 amazing Buddhist temples or the old walled city and Tapae Gate. Don’t miss Chiang Mai’s famous Night Bazaar; snap up some bargains and stock up on Thai souvenirs! Travellers booked on option 2, the flexi tour, have the option of one included activity today in Chiang Mai. You could sign up for a traditional Thai cooking class and learn how to make the local dishes. 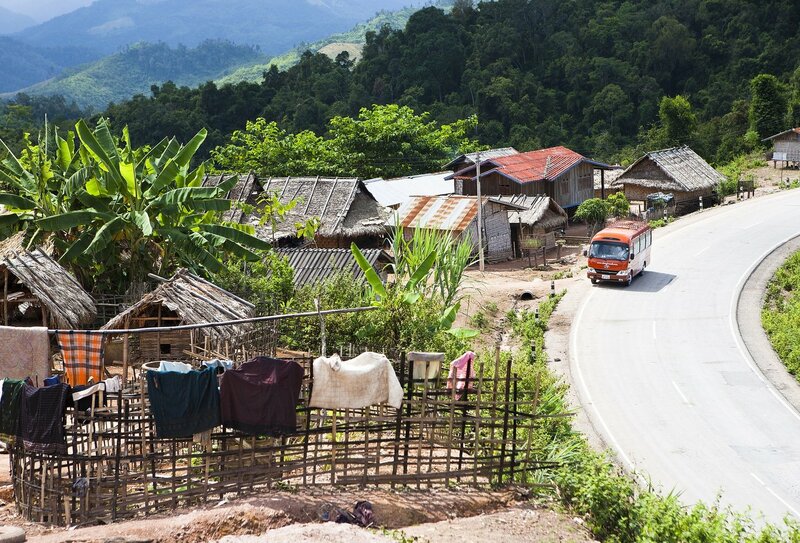 Or why not stretch your legs on a guided hike through the jungle passing through local hill tribe villages? Alternatively feel the adrenaline rush of mountain biking downhill through breath-taking countryside. Activity included (option 2 only): Choice of one of the above activities. Leave Chiang Mai at 9am, stopping off near Chiang Rai, where if you wish you can hop off and take some independent time to go trekking or explore some remote ethnic villages in the region. Pay a visit to the unique Wat Rong Khun (White Temple) with its unusual modern murals and statues, which include characters from Star Wars and The Matrix, before crossing the border into Laos. A short tuk-tuk ride takes you to the laid-back town of Houay Xai, where you will spend the night. Free inclusions for all travellers: White Temple (Wat Rong Khun) visit. Hop on board a private slow boat up the mighty Mekong River to the secluded village of Ban Pak Nguey. Relax and enjoy this extraordinary journey through lush farmland, wild jungle and splendid mountain scenery before arriving in Ban Pak Nguey in the late afternoon. 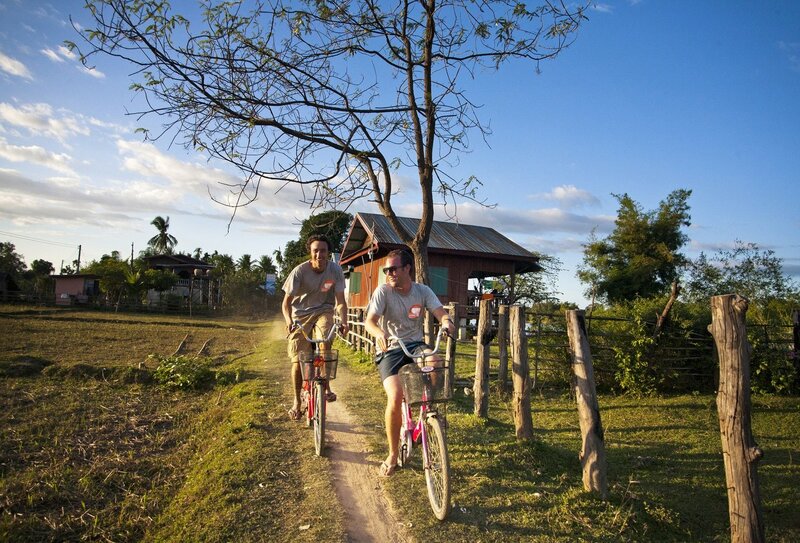 Experience a traditional taste of village life in Laos and stay with a local family in an exclusive homestay. Take part in a welcoming Baci ceremony, splash about in the Mekong River, discover the local temple, go fishing, sample the local whiskey or visit the local school to give the kids an English lesson or play a game of football. The homestay includes accommodation in an indigenous family home, a traditional Baci Ceremony, dinner, breakfast, local activities and a contribution to the village. The homestay is included for travellers on option 2. Travellers on option 1 will have to pay an extra supplement of USD17 for this overnight stay. 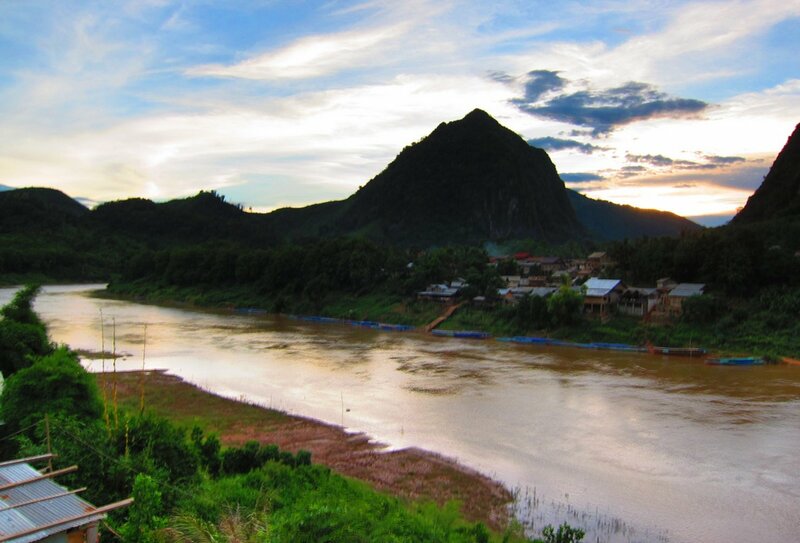 Say goodbye to the village and hop back on board your private boat, travelling downriver to the famous limestone caves at Pak Ou, which is a site of pilgrimage for many people in Laos. Marvel at the impressive range of Buddhist images scattered throughout the cave complex, before travelling on downriver to the UNESCO World Heritage town of Luang Prabang. Free inclusions for all travellers: Pak Ou Caves entrance. Crammed full of a fusion of French colonial architecture and traditional Laotian buildings, Luang Prabang has many amazing sights to see, including the National Palace Museum, the old monastery of Wat Xieng Thong and some amazing Buddhist temples and sacred sites. If you have booked option 2, the flexi tour, you will enjoy two inclusive activities today. In the morning you will travel 15 minutes outside Luang Prabang to an organic rice farm, where you’ll learn all about rice growing and get to become a rice farmer for a few hours! Learn how you choose the right rice seeds, and how to plant and plough using the friendly local water buffalo. Afterwards you can tuck in to some of the farm’s tasty rice products. In the afternoon, travellers on option 2 will enjoy a half-day tour to the stunning Kuang Si Waterfall, which is hidden off the beaten track in the jungle near Luang Prabang. See beautiful countryside, spot wildlife, pass by hill tribe villages and visit the Bear rescue centre at the entrance to the falls on this afternoon of adventure! Travellers on option 1 have a free day. Go cycling or trekking to rural villages, take a cooking class, snap up some bargains at the night market, or sign up to join in with travellers on option 2 and visit the rice farm and Kuang Si Waterfall (extra cost). 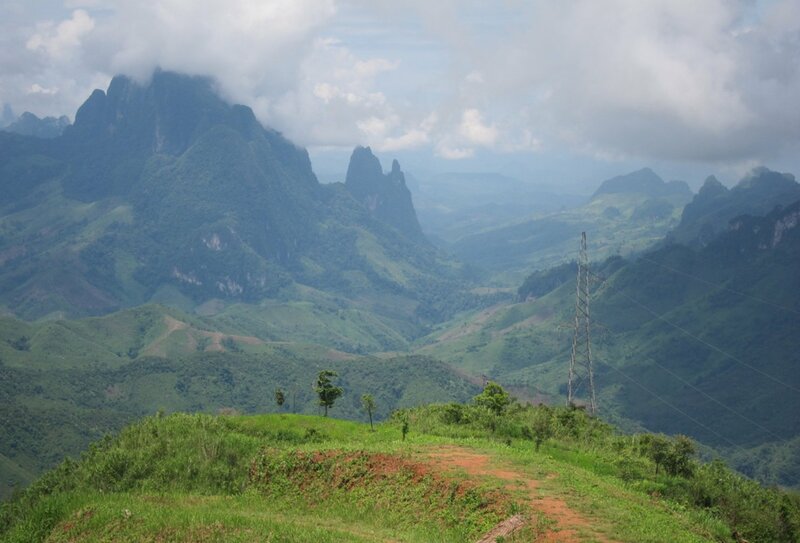 Make an early start for a mountainous journey through spectacular scenery en route to the adventure location of Vang Vieng. You will spend 2 days here, giving you plenty of chance to make the most of the awesome optional activities on offer here: you can go kayaking or cycling, try rock climbing, go hot air ballooning, party or watch retro TV in one of the town’s many bars. Leaving Vang Vieng behind, you’ll stop off at the impressive Tham Jang Cave, once used as a bunker during a Chinese invasion in 19th century, before making tracks for Vientiane. 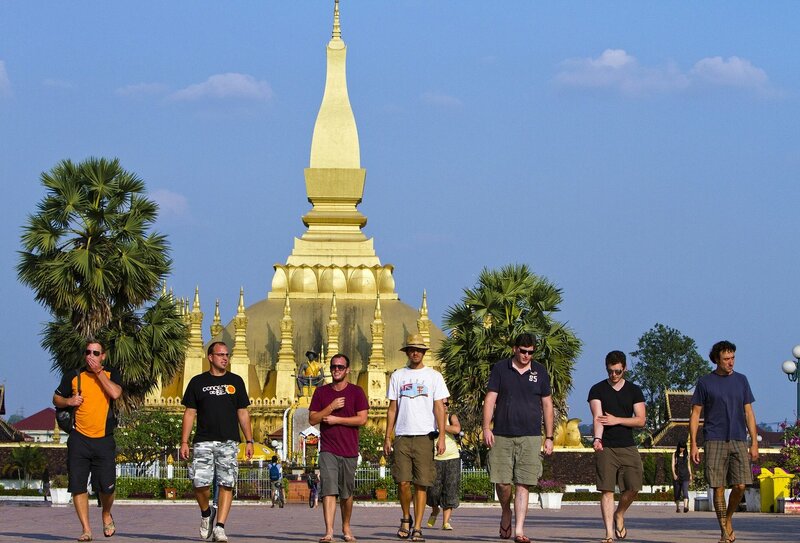 Enjoy Laos’ lively capital city as your tour guide points out Vientiane’s main attractions: Putaxai, Pha That Luang, That Dam, the Presidential Palace and the COPE centre, which raises awareness for victims of UXO (Unexploded Ordinance) and the Secret War. Spend some free time exploring the city; relax with a massage, shop in the night market or sample some tasty local dishes at a riverside restaurant. Free inclusions for all travellers: Tham Jang Cave entrance, highlights of Vientiane. Spend the first part of the day making the most of Vientiane, before hopping in a tuk tuk mid-afternoon towards Thanaleng Train Station. Jump on board a train over the Friendship Bridge to Nong Khai in Thailand, where you will pass through Thai immigration at the train station. There’s time to grab a bite before boarding an overnight train to Bangkok, where your amazing tour of Thailand and Laos will come to an end. Free inclusions for all travellers: Overnight train. Arrive early this morning back in Bangkok, where your trip ends. Please note: As this pass is a round trip from Bangkok, you are able to begin your journey anywhere along the route (not just Bangkok), and finish where you started. Let us know your preferred starting location when you book. Please note that we will book the pass for you as open dated, so you can decide the date that you want to start the pass- please download the trip notes for more details. You will need to arrange your arrival into Bangkok at least the day before your travel pass route starts, as you will be leaving early (8am start) the following morning. You will need to arrange your own accommodation for this first night in Bangkok. Option 1, bus pass only: No accommodation or meals included. Option 2, flexi tour: One night of accommodation included in each stop on the tour route. Meals at own cost. Please note: For all travellers, accommodation for your first night in Bangkok is not included, and as your tour departs at 8am, you will need to book accommodation for this first night. We can advise you of suitable accommodation options; just speak to a travel advisor. Chiang Mai: Guesthouse located near the historic, old quarter USD12-20 per person per night. Houay Xai: Guesthouse with Mekong River views USD20 pppn. Ban Pak Nguey: Village stay includes accommodation in an indigenous family home, traditional Baci Ceremony, dinner, breakfast, local activities and contribution to the village USD17 pp. Luang Prabang: Guesthouse with fan or AC private rooms close to night market USD12-40 pppn. 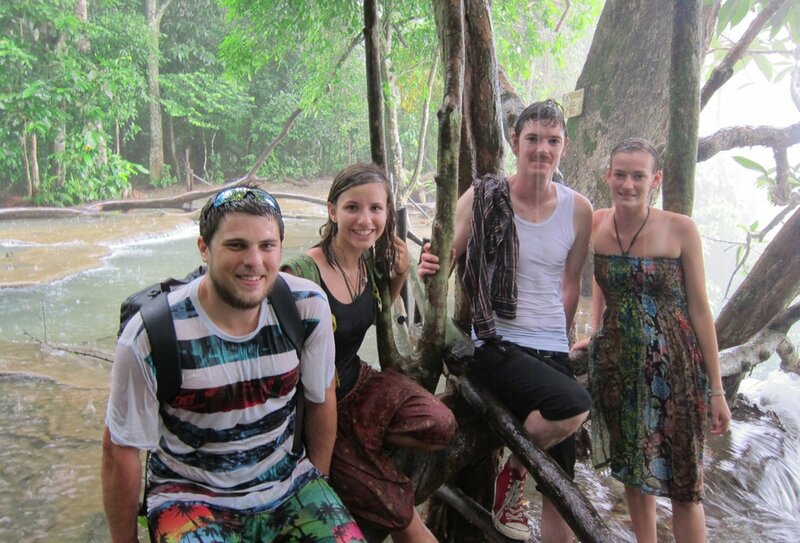 Vang Vieng: Family run guesthouse USD8-30 pppn. Vientiane: Hotel with modern facilities including WIFI and breakfast USD20 pppn. We reserve accommodation in all our overnight stops so you’ll be guaranteed one night’s accommodation in each overnight stop if you want it. If you wish to take advantage of this offer, tell your guide/driver and they will book it for you (you pay as you go). 2 nights will be spent on overnight trains and the cost of this is included. 2 nights’ accommodation in Chiang Mai: Guesthouse located near the historic, old quarter. 1 night’s accommodation in Houay Xai: Guesthouse with Mekong River views. 1 night’s homestay accommodation in Ban Pak Nguey: Village stay includes accommodation in an indigenous family home, traditional Baci Ceremony, dinner, breakfast, local activities and contribution to the village. 2 nights’ accommodation in Luang Prabang: Guesthouse with fan or AC private rooms close to night market. 2 nights' accommodation in Vang Vieng: Family run guesthouse. 1 night’s accommodation in Vientiane: Hotel with modern facilities including WIFI and breakfast. As this is a flexible trip, you are welcome to stay longer in any of the locations along the route, although extra accommodation will be at your own cost. If you want to make the most of your flexible travel pass, your guide can advise you about suitable local accommodation options in each destination. The minimum age to join this tour is 18. Thailand: Without a visa, British nationals arriving by air into Thailand can remain in the country for a maximum of 30 days, though if you arrive across a land border this may be a shorter stay (please check with the Thai embassy for current details). Laos: Visas for Laos are usually issued upon arrival at the border but please check with the Laotian embassy before you travel. Anyone doing Southeast Asia Adventure 27th June? Anyone doing the indochina discovery on the 28th July?